We're often told that certain products are absolute 'must-haves' in every household. Have you every thought that your MooGoo serum could be one of them? Tammi, a 30-year old stay at home mum from Newcastle, recently got in touch to tell us that our Tamanu Oil is an absolute necessity for every Australian's bathroom cabinet, after if helped her elderly father overcome a wound he had struggled with for five years. MooGoo Toothpaste ("Moothpaste" as it's affectionately known) took quite a few years to develop. We've had more than a decade of experience taking care of people's skin, and we like to consider ourselves very knowledgeable when it comes to personal care products. But dental care was a whole new frontier for us! So we took our time. Did our research. Made sure that we created a product that was both effective and in line with our ingredient philosophy. As you can imagine, we learned lots along the way, and we thought we'd share these insights with you as well. Is MooGoo OK for babies? Yes! At MooGoo we only use ingredients that we're totally comfortable putting on ourselves, our loved ones, and our customers! Q: I'm Vegan - Can I use MooGoo? A: Yes* It's not surprising that lots of people think MooGoo is made from Milk. We're quite proud of our Moo-story, we love cows and we're not shy about using the occasional cow based pun! We even have our own range of plush toy cows! Can I use MooGoo on my pets? Our wonderful MooGoo Herd loves to share their MooGoo goodies with their children, family, friends, work colleagues, and sometimes even random strangers on the street (we're so appreciative of this guys!). So it makes sense that they'd want to share the MooGoo love with their pets as well! Is MooGoo OK to use on pets? Have you 'herd' of the hygiene hypothesis. The hygiene hypothesis says a child's environment can be "too clean," and the lack of exposure to germs does not give the immune system a chance to develop resistance to diseases. So the hygiene hypothesis suggests exposure to a wide range of micro organisms helps train the immune system so that it does not react inappropriately to various allergens. Lack of exposure, according to some, may increase the risk of asthma, eczema and hay fever. But, some germs can make a person sick. The conflict between cleanliness and exposure can leave parents feeling confused. There are many microbes that can make children very sick, such as respiratory syncytial virus (RSV), E.coli and salmonella. What should we be exposed to and what should we be protected from? MooGoo Serums & Oils - Which Suits Me Best? Everybody's skin is different, and when it comes to a skin care routine there can be thousands of variations. The principles of healthy skin are simple, so we're lucky to have a good solid range of healthy skin products that our customers can use to create their own beauty routine. A popular, but sometimes confusing part of this is our range of serums and oils. To help guide you in adding them to your own beauty routine, below is an overview. We'll explain the ingredients, and what studies have shown they assist with. 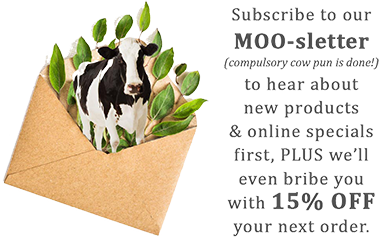 Most importantly, we've also included feedback from our MooGoo Herd so you can learn from our real-life experts! Lauren Patterson is a mother, blogger, fitness competitor and PT Student. She shares the highs and lows of her life openly and honestly, via her blog and Instagram. She's as refreshingly real as our MooGoo Herd (and our skin care ingredients!). We caught up with Lauren recently. Which MooGoo Moisturiser is Right For Me? Which MooGoo Moisturiser is right for me? It's a question we're often asked. When MooGoo first began (back in 2004) it was an easy answer - Skin Milk Udder Cream! It's still a very effective moisturiser and one of our most popular products - but these days, the range has expanded to cater for people's preferences and skin types. Here's an easy guide to help you pick the MooGoo Moisturiser that's right for you! Brogan Kate is a beautiful, talented, young Australian woman whose sense of style and creativity together with her social media savvy and passion have shaped her into the successful business owner of Brogan Kate Intimates that she is today. The team at MooGoo Skincare and Dusty Girls love her effortlessly chic style, and always enjoy working with her. We caught up with Brogan recently for a quick Q & A. What MooGoo products should I use to help with Acne? If you’re reading this, chances are you, or someone you love has Acne, and has probably also tried lots of different products. You’d also know that there are lots of factors that cause acne and treatments can have varying results. It’s the way skin is – it’s never quite the same as anyone else’s! Recently, we caught up with Codie Klein who lives locally and loves MooGoo! Codie describes herself as a "surfboard swerving, healthy little nerd girl" Between studying fulltime at Bond University, and travelling around on the world surfing circuit, we'd add "busy" to that description! Making MooGoo isn't as complicated as you might think! In fact, with a few ingredients from your kitchen and a couple of purchases, you could probably make your own - given the time and inclination of course. Our resident MooGoo experts, Sammy & Gabby show us how!